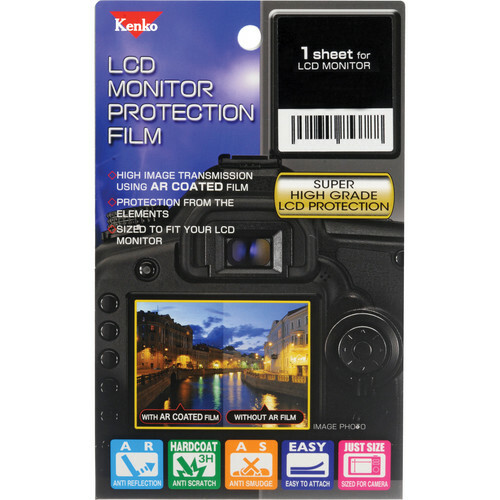 Protect your camera's LCD from fingerprints, smudges, scratches, and other unwanted residue or incidental damage with this LCD Monitor Protection Film from Kenko. This film features a multi-layer anti-smudge and anti-reflection coating to minimize flare while increasing image transmission and enhancing viewing in difficult lighting conditions. A hard coating core layer also protects your LCD from scratches. This item is specifically designed to fit the main LCD monitor of your Panasonic Lumix GH5. It is easy to apply using a removable film applicator tab. Box Dimensions (LxWxH) 6.5 x 4.0 x 0.3"